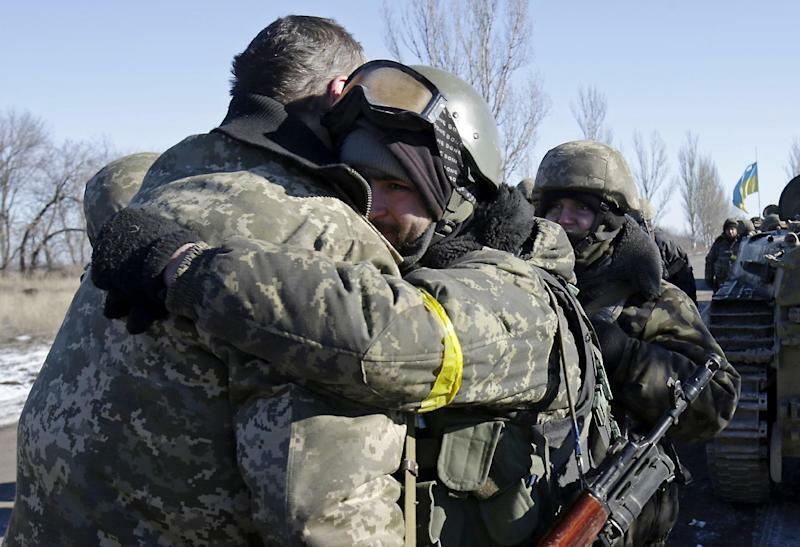 Artemivsk (Ukraine) (AFP) - Haggard but relieved after days of fierce fighting with pro-Russian rebels, Ukrainian soldiers on Wednesday retreated on foot and by truck from the battleground town of Debaltseve. Covered in the grime and soot of battle the government troops arrived at the nearest Kiev-held town of Artemivsk -- some 35 kilometres away (22 miles) -- exhausted and hungry. "We should have pulled out earlier," one weary soldier told AFP bitterly. Nearby, dozens of tanks, armed vehicles and trucks carrying hundreds of troops rumbled along the snow-covered road. 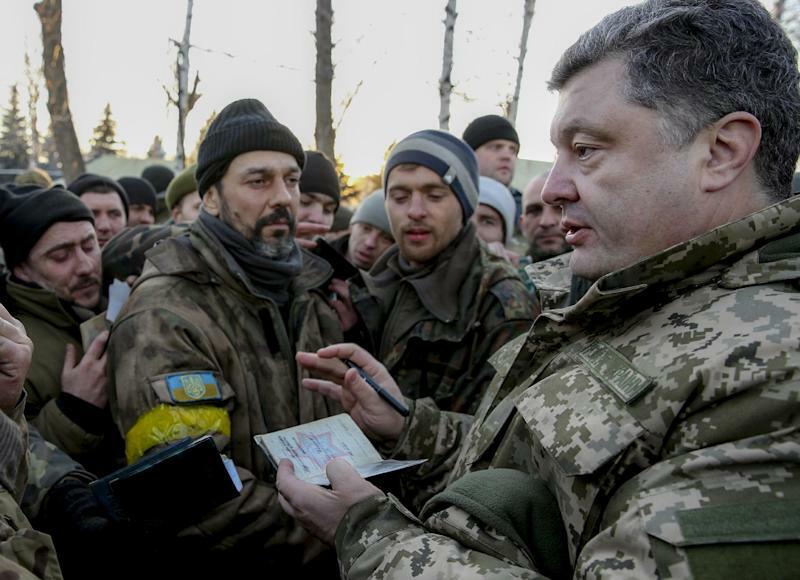 Dressed in military fatigues, Ukraine's President Petro Poroshenko said in a video address that the withdrawal he had ordered was "planned and organised" but the soldiers on the road told a different tale. "We didn't hear anything about an order to pull out," another serviceman said, refusing to give his name or division. "We only found out about it when our heavy armour started leaving." The loss of Debaltseve -- a vital railway hub linking the rebel centres of Donetsk and Lugansk -- is a bitter blow for Kiev. Ukraine and the United States has accused Russia of piling in weapons and troops to spearhead the onslaught, that continued despite the start of a nominal truce of Sunday. In his address, Poroshenko said that some 30 soldiers of the roughly 2,000 who withdrew were reported wounded by artillery bombardments. 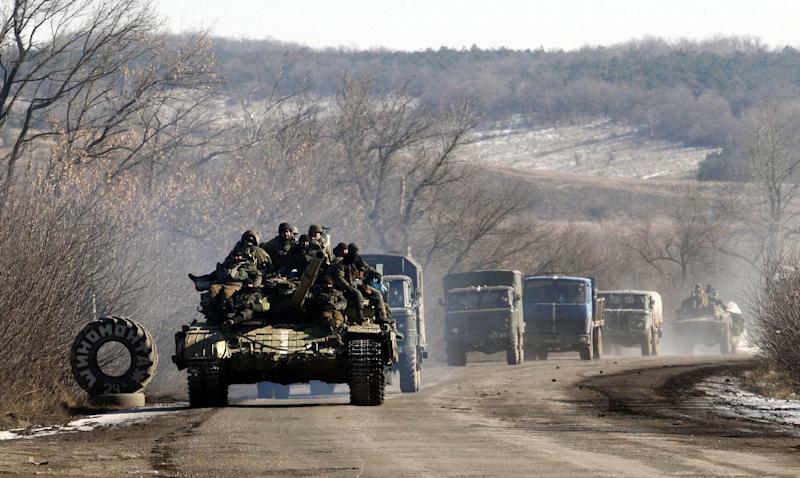 But the fierce clashes in Debaltseve had clearly taken a heavier toll on the Ukrainian forces. Outside the morgue in Artemivsk an AFP journalist saw body bags holding the corpses of five Ukrainian soldiers lying next to a refrigerated truck. Inside the morgue another five bodies dressed in camouflage were covered with sheets. A row of makeshift coffins was lined up. "The corpses of 13 Ukrainian servicemen were brought in today," Ruslan Fedonyuk, director of the morgue in the government-held town of Artemivsk, told AFP. "They delivered them this morning and we have now organised a vehicle that will collect them and transport that for further autopsies and registration," he said. The fate of the troops in Debaltseve -- which has seen the vast majority of its 25,000 civilian population flee in terror -- has been the focus of intense international disputes as the fighting raged on. Despite the constant rebel insistence that they had surrounded the town, Ukraine officially continued to deny their forces were surrounded. Russia claimed that up to 8,000 troops were trapped there and President Vladimir Putin on Tuesday called on Ukraine to let them surrender and accept defeat. "Obviously it's always bad to lose," Putin said during a visit to Hungary. "But life is life and it still goes on." Rebels have claimed they have taken hundreds of Ukrainian soldiers prisoner and Kiev admits that some of its troops have been captured. While Ukrainian soldiers were streaming out in the other direction, at midday on the rebel side the booming cannonade of artillery fire could still be heard coming from Debaltseve. Separatist commander Maxim told AFP that Ukraine's National Guard had put up fierce resistance and many fighters had been wounded over the past few hours. Trucks carrying insurgents and a column of fuel tankers and tanks could be seen heading away from the front. By 3 pm silence had fallen over Debaltseve and video footage shown by Russian state media purported to show triumphant rebels hoisting their flag over what they said had been a key Ukrainian base in central Debaltseve. In government-held territory, despite the fatigue and the confusion of the retreat, some of those who made it out of Debaltseve remained defiant in the face of defeat. "Glory to Ukraine!" a soldier shouted at a crowd of local residents who had gathered to watch their retreating army arrive.